There are a number of group messaging applications that are catered towards business users, such as Yammer or Socialtext. Today, Micromobs is launching a web-based group messaging app aimed towards communication within social groups among friends and family. 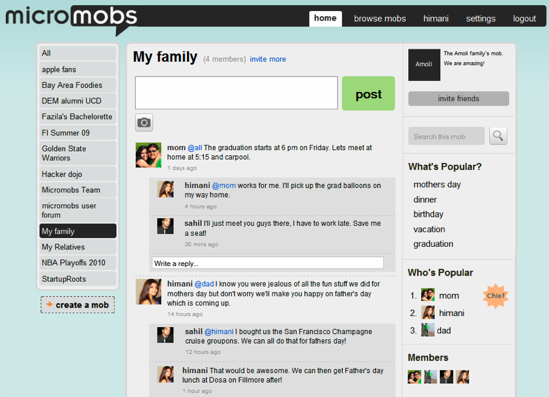 On the site users can create and join groups or “mobs” and create a stream of messages uniquely relevant to each user. Users are able to post messages, photos and files and respond in stream to threads, keeping their conversations organized in an ongoing discussion. Users can also push their messages to Twitter and Facebook and make groups private. Micromobs, which was incubated at the Founder Institute, is designed to fill the gap for a simple group application for the masses. that connects family, volunteer organizations, poker groups, sports teams etc. Micromobs also could be ideal for group communication when planning a next trip, or organizing an event. Ajay Kamat, founder of Micromobs, says that he sees his biggest competitor as email, which is the most common threaded communication for among families and friends. Of course, people use Facebook and other social networking applications for group communications, but the application is hoping Facebook Connect will entice users to be able to use the platform and publish to Facebook at the same time. The startup is also planning to launch mobile apps in the near future.